In part 1, I dealt with problems and concerned raised by the study itself and the data it used. In this section I will present ideas that counter the overall conclusions atheist draw from the study, namely that atheism must be true because it's believed by more intelligent people. The first argument that I present is about the lack of longitudinal data. The long discussed shock of freshmen encountering Atheistic professors at college and the transition problems from childhood beliefs to intellectually defensible beliefs have been reduced in recent years. Today the shock comes earlier and with less force than in decades past.". Nevertheless, they are still free from the parents for the first time. They are striking out in independence for the first time. Now its time to rebel and experiment and throw off the chains of parental oppression. Few if any of these studies follow them through life to determine if they became believers latter in life. This is a real possibility that they will. Studies show that people become more religious as they age. McCullough et al found that "results were consistent with the rational choice theory of religious involvement." The Zuckerman study found that the negative correlation was stronger in collage age than before college. So this is a good indication that perhaps its the college years when people experiment and the more intelligent are more likely to reject for a time what their parents taught them then they will come back to it latter in life when they are more mature. The Atheist IQ studies, which are not so much done by atheists per se as used by them, are not good predictors of what intelligent people really think. They really only predict the extremes that intelligent people go to during extreme parts of their lives. There is dissatisfaction with the conventional IQ test as a measure of intelligence.For example "Richard Nisbest psychologist from University of Michigan, Ann Arbor, difference in IQ scores largely disappear when researchers control for social and economic factors." David Shenk argues that the standard Stanford-Binet test only measures a variety of skills and thus is an indicator of academic progress. They are designed statistically to keep in same place in the pack but they are not indicators of intelligence. But did this stability prove that the tests revealed innate intelligence? Far from it. The reality is that students performing at the top of the class in 4th grade tend to be the same students performing at the top of the class in 12th grade, due to many factors that tend to remain stable in students' lives: family, lifestyle, resources, etc. Being branded with a low IQ at a young age, in other words, is like being born poor. Due to family circumstances and the mechanisms of society, most people born poor will remain poor throughout their lives. But that doesn't mean anyone is *innately* poor or destined to be poor; there is always potential for any poor person to become rich. A) measure developed skills, not native intelligence. No, and no. Very sloppy science and journalism has led us to believe that what scientists call "heritability" (derived from twin studies) is the same thing as what we ordinary folk call "heredity." In fact, they are not even remotely the same thing. Genes certainly do have an impact on intelligence, and everyone has their own theoretical limits, but every indication is that most of us don't come close to our true intellectual potential. He links to another article, by himself, "The Genius in All of us." intelligence at both the behavioral and biological levels. 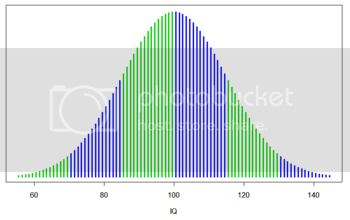 One of the major disproofs of the validity of IQ tests is a phenomenon known as the "Flynn effect." This is a disproof becuase it indicates that IQ not fixed, it rises with time and that what is being measured is actually not intelligence but cultural literacy. Duckworth's second study involved data from an earlier study, following 500 boys age 12, tested in the late 80s, they were video tapes and signs of boredom and lack of motivation were observed. The study was longitudinal, following the boys into early adulthood. There were no difference in IQ or other factors bewteen the boys. The question is if IQ is really measuring motivation, what are atheists motivated toward? Why would those who don't believe in God have a greater motivation than those who do? Let's not forget the idea that IQ tests are also measuring sort of "cultural literacy," or we might call it "indoctrination." People who score higher on IQ tests are those who have more successfully indoctrinated into the ideology of scientism, since that seems to be the dominate force in the culture. That tallies with findings I've discussed on AW about atheists low self esteem. Leslie Francis produced the correlation between rejection religion in youth and low self esteem. There is a voluminous data consisting of many studies already on the issue of negative God image and the relation it bears to self esteem. It seems that negative self esteem is connected to negative God image. Persons with high levels of self esteem may find it difficult to share the same religious belief. A theology predicated upon a loving accepting God is cognitively compatible with high self esteem, but it could be a source of discomfort for a believer low in self esteem. It does not make good cognitive sense to be loved when one is unlovable. Consequently the latter person can march to a different theology, one that is more consistent with his self image. (Benson and Spilka 209-210). If we put together the two explainations, cultural indoctrination into an ideology of technique (scientism), with the idea that IQ represents motivation, what are the atheist's motivated to do but to excel at the culturally prescribed ideology as a means of bolstering self esteem? Since they reject God based upon self esteem, they connected the bolster (scoring well on tests as a mark mastery over the culturally prescribed ideology) as an alternative to belief. Thus they are initially spurred by aversion to belief based upon low self esteem (if you don't like yourself why would you like the one who created you to be the way you are?) the means of bolstering self esteem is to replace the creator with a process of accident then mastering the understanding of that process to show one's worth. If religious are more inclined to accept personal experience of life as a clue to ultimate reality and the meaning of their lives then they are not as motivated to excel in mastery of an ideology, or at least not that ideology, but to seek more truth on a personal level that can't be subjected to such tests. Francis, L. J. . "The relationship between intelligence and religiosity among 15-16 year olds." Michel E. Mcullough, Craig K. Enders, Sharon Brion, Andrea R. Jain, "the varieties of religious development in adult hood: A longitudinal investigation of religion and rational choice." (2005, Vol. 89, No. 1, ) 78–8, 78. Zuckerman, et al, Op. Cit. (see part 1) from the study Abstract, 1. Steven Ceci,S. J., On Intelligence: A bio-ecological treatise on intellectual development. 2nd ed., Harvard University Press. 1996. quoted in Shenk, Op. Cit. Richard E. Nisbett,Joshua Aronson and Clancy Blair, et al "Intelligence, New Findings and Theoretical Developments." American Psychologist, The American Psychological Association, vol. 66, no. 2 (February March 2012), 130-159, 130.
accessed 8/16/13. Nisbet is University of Michigan, Aronson and Blair are New York Univ. Angela Duckwork in the Proceedings of the National Academy of Sciences, quoted by Balter op.cit. Metacrock, "Rejection of Christainty and Self Esteem," Review of a Study by Leslie J. Francis, et al." Atheist Watch, blog Oct, 25, 2010. http://atheistwatch.blogspot.com/2010/10/rejection-of-christianity-and-self.html accessed 8/15/13. Leslie J. Francis, in Research in the Social Scientific Study of Religion, Leiden, Netherlands: Koninklijke Brill NV, Ralph L. Piedmont, ed.,Volume 16, 2005, 2006, 108. Benson, P., & Spilka, B. (1973). quoted by Leslie J. Francis, in Ralph L. Piedmont, op.cit.